Valve Engineer Wants To Go To Mars. No, Really. If you think Valve Time is bad now, wait until their engineers are on another planet. Meet Jeep Barnett. He's a programmer at Valve, a former student at DigiPen, and one of the original creators of Narbacular Drop, the 3D puzzle game that let you navigate the world using a pair of connected portals. He went on to help create that game's spiritual successor, Portal. And he wants to go to Mars. Seriously. He wants to live there. "Living in the wilderness has always appealed to me on a primal level," Barnett told me in an e-mail. "I love being able to take responsibility and direct action for my day to day survival. Lately I find myself taking backpacking trips on less worn paths and staying out for longer. Becoming a Mars frontiersman is the ultimate commitment to that sort of lifestyle." "I grew up believing that everything in science fiction would eventually become science fact," Barnett says in his Mars One video application, which you can watch here. "So I get super excited for each advancement that happens in my lifetime. I want to help make this a reality." "When you consider all the crazy places that humans have settled on Earth, living on Mars doesn't seem that far-fetched!" Barnett told me when I asked if he'd be ready to leave right away. "We're actually coming up on the 100th anniversary of the first permanent base in Antarctica. I wouldn't want to hop a ship without the years of critical training and preparation needed, but hypothetically, yes, I'd be ready to leave next week without regret." If selected, Barnett said he wants to help maintain safe living conditions, engineer facilities and infrastructure, help ensure that they have a stable food supply, and create entertainment, like games and music, for everyone else on the foreign planet. I asked what he'd want to bring. "I'm not sure what the weight limit is, but I know that every pound is expensive," Barnett said. "I'd want a simple infallible music device such as parts for a xylophone and a thumb-drive full of photos, art, comics, books, music, and games from Earth." And as for his current projects? 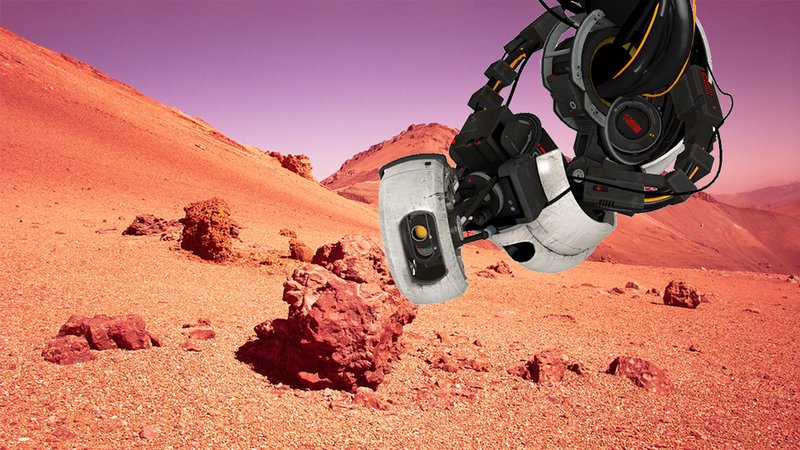 Surely Half-Life 3 (or whatever) must be more exciting than Mars? "It's hard to talk about this Mars stuff with seriously because I know that it's such a long shot," Barnett said. "In the likely scenario that I live out the rest of my days on Earth, I'd still be completely satisfied! I love going to work every day with all the awesome projects and people at Valve. But if I'm selected to go, I would definitely push to tie up some loose ends."